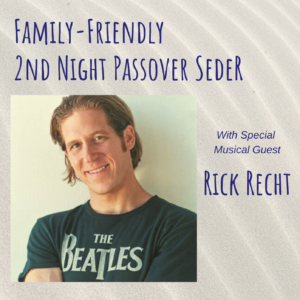 Join us for this innovative and exciting 2nd night Passover Seder with special musical guest, Rick Recht! Rick, Lucy Greenbaum, and the Shaare Emeth clergy will lead us through this festive, musical seder appropriate for all ages, including families with young children, singles and empty-nesters. RSVP’s Required by Tuesday April 16th – seating is limited! TICKETS FOR THIS SEDER ARE NOW SOLD OUT. PLEASE CONSIDER JOINING US FOR ANOTHER ONE OF OUR PASSOVER CELEBRATIONS, WHICH CAN BE FOUND HERE. If you would like to be added to the Passover Rocks waitlist, please call the Temple Office at 314-569-0010 and request to have your name added to the list. Thank you! Check out some of Rick Recht’s Recent Music Below!